Well there's a lot to get through this morning. We'll start with the manager who went on French radio last night to be interviewed about the current situation at Arsenal. He also reflected on our business during the summer. Wenger was interviewed by former France international Bixente Lizarazu on his RTL radio show. Most interesting was that he doesn't believe Robin van Persie will leave the club - and there are stories around today in the English media which suggest RVP doesn't want to leave in January - and Wenger is sure of the Dutchman's commitment. The manager was asked about Emmanuel Petit's comments that players were having to leave Arsenal to win trophies. 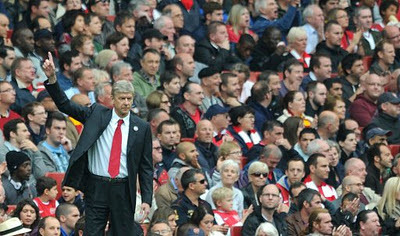 However Wenger was having none of it. "No, it's not that [players have to leave to win titles]. The problem isn't that. Frankly, if you compare what Manchester City have won in the past and what Arsenal have won, then you don't go to Manchester City to win titles. Players go to Manchester City because they pay much better than Arsenal." Frankly I wonder if the manager has got his blinkers on. Players are leaving Arsenal for the money yes, but they aren't blind to the fact that we've not won a trophy for six years. Manchester City on the other hand - whilst not having the same history of winning as we have in the recent past - won the FA Cup last season. And whilst the manager is right there is a financial correlation - as pointed out constantly by the Arsenal Supporters Trust - that the league table and the amount spent on wages have a reflection on where you finish in the table, Manchester City will finish higher than Arsenal because they can afford to spend more money. For the first time Wenger has admitted the club were under huge strain because of what went on during the summer. "It was a very difficult summer because half the dressing room wanted to leave. "You're preparing for a season where you don't know who's going to come in, the players who are staying are asking themselves what's going on at the club, you've got a pre-season tour of Asia. It was extraordinarily difficult. "What saved us is that we're a club that are extremely solid and united. Other clubs would surely have gone to pieces in those circumstances." Personally I don't believe we have yet to fully recover from what happened with the departures of Fabregas and Nasri. And from what I hear from the training ground, it's not the best place to be at the moment. I hope the manager and the chief executive have sat down and talked about what went on. This season hasn't started well for the club in my opinion because of what happened during June, July and August. Had we been more ruthless, we would have been in a better position. I hope they both agree that we should never be in the same position again next summer. The manager knows we're not where we need to be and has conceded the title already. "We've disappointed this season so far, given what's expected of us, but I think we're on the up again. The problem is you can only climb the table slowly. "We're not too far away in terms of points from fourth place. We're too far away [12 and 10 points] from the top two." There is still plenty of league games to go but I agree with the manager we're too far off the pace to catch the Manchester clubs. We have a chance of getting back into the top four and have to hope we have a decent run in one of the cups. The manager is backed up this morning by his chairman Peter Hill Wood who believes that players are greedy and have so much money now they don't know what to do with it. It will be interesting to see what line of questioning the manager faces later when he meets the media ahead of the club's Champions League game with Marseille later. The squad could be without Kieran Gibbs and Aaron Ramsey, both of whom face late fitness tests. And finally, an interesting story in the Daily Mirror who suggest Arsenal will recall Brazillian Wellington Silva from his loan at Levente because he's not getting games. If you missed our late post yesterday, read all about Robin van Persie and why he's the league's best striker in the latest Inside the Formation post.